Have you ever packed perfectly for a trip? There is something magical about remembering every pair of socks, toothpaste, undershirts, and your phone charger! But what happens when you go to pack for your journey back and realize that somehow, you have accumulated more than you left with? Whether it is souvenirs and gifts for everyone you know, an amazing deal on something authentic you just couldn’t pass up on, or a piece of art that you will hang in your home for decades to come, sometimes you just run out of baggage space. If this has ever happened to you before, or if you suspect it might in the future, consider bringing along a collapsible bag. Just a fraction of their size when they are collapsed, these backup bags can be thrown into your luggage at home, only to be expanded for use later. You may have to pay an extra bag fee, but it will probably be worth it. 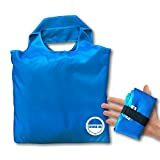 If you only need a small amount of additional space, consider throwing this low-profile folding shopping bag in your luggage. It is so low profile when it is folded that you will barely notice it – it will just about fit in the palm of your hand. When expanded, it turns into an oversized tote-bag which can hold some extra books, magazines, clothes, or shoes. If you wind up using this collapsible bag for your luggage overflow, then definitely check your regular bag and make this your carryon. It doesn’t zip closed so you should store it under the seat in front of you. It comes in a bright, memorable blue and is constructed of super durable nylon. If you are going on a longer trip and anticipate needing a lot of extra space on the way home, then consider this 36” folding duffel. The entire bag packs away into a pouch roughly the size of a drawstring backpack, but once it is unfolded it is a large, traditional duffle bag that even has wheels! It can be rolled along the ground, or worn over your shoulder with a detachable padded shoulder strap. 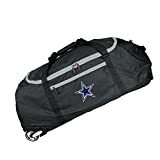 This bag is sturdy and zips closed, so if you want to check this and keep your standard luggage on you, you can easily do that. If you anticipate purchasing something large, bulky, or just difficult to pack, bring this collapsible bag with you. You can even choose your favorite NFL team to make it more personal. This is another duffel bag, but it is much smaller than the last one. Instead of being the size of a checked bag, it is the size of a personal item. In fact, it is designed to sit right on top of your wheeled suitcase for easy transportation. When it is expanded it measures 13.5” x 20” and can hold up to 40 liters. It is made of tear-resistant nylon and comes in eleven bright and noticeable colors. This is a fantastic medium sized bag for anyone who isn’t quite sure if they will need an extra bag or not. It is so low profile when it is folded down that you really can’t lose! One reviewer sang its praises, claiming that this collapsible bag was so easy to travel internationally with when her daughter was studying abroad. If you aren’t just worried about too many items on your way home, but how to carry them, invest in this collapsible backpack so that you can pack away your extra-items and lug them around right on your back. It folds down into a tiny little envelope and even comes with a carabineer you can clip right to the outside of your main luggage for transport. When it is time to unfold the pack to use it, you will be surprised that it expands all the way out to 33 liters! It is a classic backpack shape, but also includes two exterior pockets and two water bottle sleeves that will keep your items separate and organized. This collapsible bag comes in 11 fantastic colors. When it is empty, it is super light (weighing only a half a pound), so you really don’t need to worry about adding extra bulk to what you are already carrying. 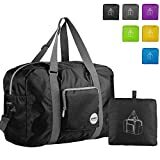 Between how small and light it is empty, and how you can haul it around on your back when it is full, this is a fantastic choice for anyone who has a shopping habit when they travel. So the next time you head somewhere with a full wallet and shop-a-holic tendencies, make sure you have a plan for getting all of your fantastic purchases home. Whether you find your treasures at a night market in Hanoi, Vietnam, a boutique shop in Lagos, Portugal, at the Galleria mall in Houston, or at a Farmer’s Market in Cape Cod, you have got to have a way to get it home. There is a collapsible bag on this list to fit any and every shopping habit. Throw one in your purse or in a pocket and thank yourself later when you need it in a pinch!